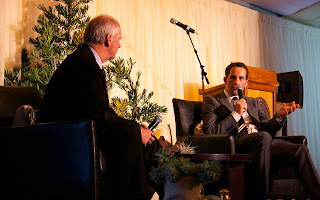 At the 8th Annual Leukemia Cup Dinner hosted by The San Francisco Yacht Club, sailor, commentator and author Gary Jobson asked guest speaker Sir Ben Ainslie whether he’d like to round out his Olympic medals and recent America’s Cup victory with a Round the World win. “No, not really!" 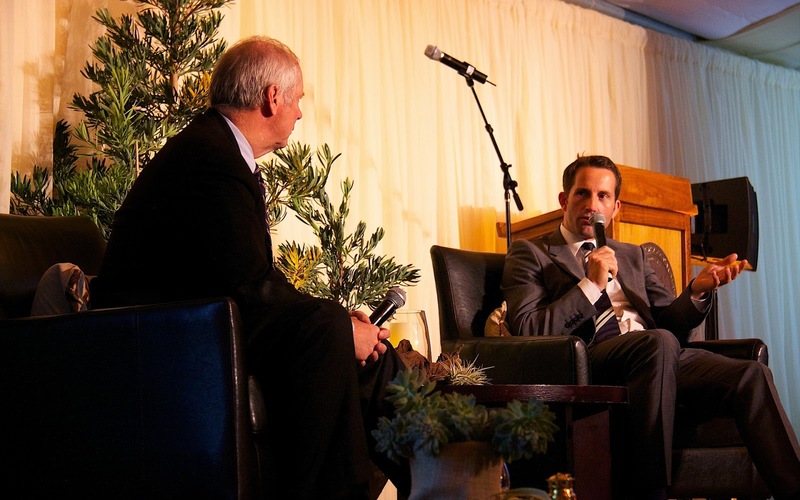 said Ainslie, quite candidly, agreeing with Jobson that a hot shower at the end of the day is a good thing. He did add however that his Dad competed in the first-ever Whitbread race...and had also dealt with the difficulties of cancer. 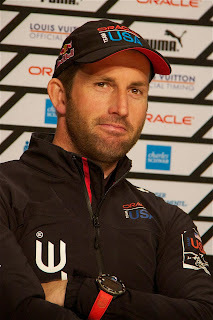 Gary J: Oracle Team USA was a little bit behind the 8-ball there, digging deeper, and there was a change. And you were the change, coming on board. How did it feel coming on a third of the way through the regatta and feeling like you had some pressure on your shoulders? Ben A: We were obviously in a pretty difficult situation as a team. We were in dire straits and I think all of you here as sailors would know what the sport is like. There’s a lot of different components to it. So, yeah, we weren’t going particularly well, our speed wasn’t that good particularly on the upwind legs, I think the idea was to bring in a fresh face and a different perspective. My goal was to try to be Mr. Positive even though things were looking about as bad as they could be to try and get some enthusiasm going. 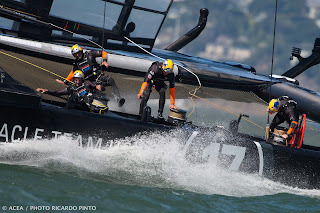 And of course this America’s Cup, it was always going to be a development race with a new class of boat with the AC72 multihulls, foiling and everything that goes with that. There was always a chance that we could develop faster than the other team and build some confidence from that. Ultimately that’s what happened. It was definitely a team effort - the designers, the boat builders, the sailors all coming together to make some..actually some quite small changes. There’s been a lot of talk about Herbies? I don’t even know what a Herbie is but maybe someone else here knows. But it didn’t have anything to do with us winning the America’s Cup, it was about small changes and looking at technique on the boat with the sailors and the designers and ultimately winning some races and getting some confidence. Ben A: They are totally different challenges. I’ve been in a lot of difficult spots in my career as I know you have and a lot of great sailors have. Ultimately if you’re going to put yourself in those positions you’re going to end up in a tough spot from time to time. 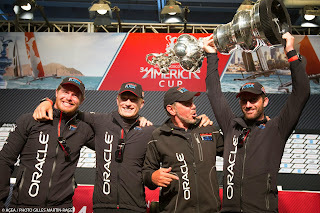 I think in this particular instance with this America’s Cup, it was really a credit to the team. There was no finger pointing, there were no heated arguments, we were clearly at a disadvantage earlier in the event and clearly behind speed-wise but we just kept to the task and I guess that’s really got to be credit to the management with guys like Russell Coutts, Grant Simmer and Larry Ellison to keep sticking with the team and keep trying to develop increased performance of the boat. It’s very easy when things are going wrong to start pointing the finger and even give up early on. I think it was impressive that the team stuck with it. Gary J: It was fascinating to listen to you and Tom Slingsby talk - I think it’s a really good lesson for all sailors particularly young people that communication makes a difference. Did you plan that out, because in a Finn you don’t get to talk much to anybody? Ben A: It was an amazing experiment because when they first put me on the boat it was really like putting three helmsmen together on the back of the boat. Jimmy and I had never really sailed together and I’d never sailed with Tommy either. It was a bit of a gamble for sure. I have to give a lot of credit to John Kostecki who did a fantastic job of tactician up until that point and it wasn’t that John had necessarily done anything wrong, it was that there just needed to be some kind of change to up the atmosphere on the boat because things were not looking good. John was just amazing. They’d made the change, he’d already left for home and I called him and said, “Look John, I’m sorry about this,” and he said, “It’s fine, I want the team to do well, I’ll come in tomorrow morning and we’ll go through all the software etc.” I hadn’t even seen the navigational software up until that point because I’d been steering the other boat. To have that kind of support, I think was just a measure as to the kind of team it was and especially John despite the disappointment of not being on the boat and racing. Gary J: You’ve got to know how he is to race against, and of course you together had this unbelievable turn-a-round? 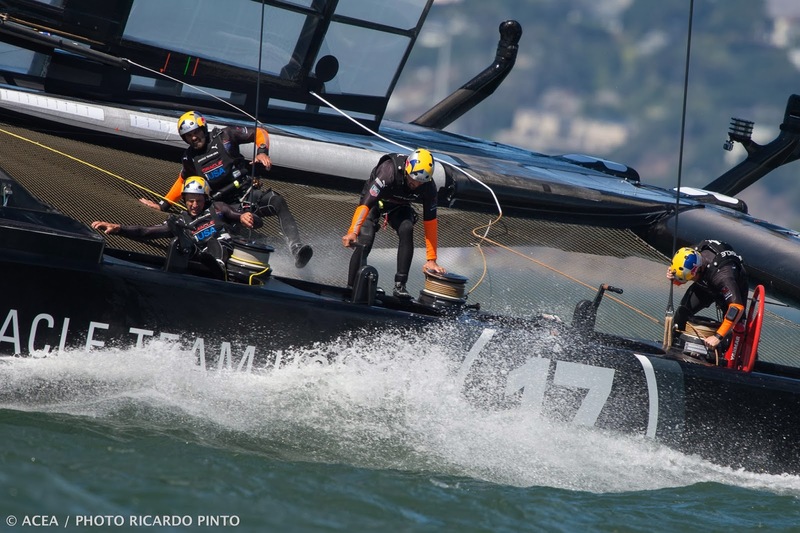 Is Jimmy Spithill fearless? Ben A: I’d say so. We all saw what he was like in the press conferences, right? You guys all had a good crack at him and he came through that pretty unscathed. He’s a machine, emotionless. Gary J: What sort of psychology was going on there at those press conferences? Ben A: Unless there were some big changes I didn’t know about, I think he was pulling everyone’s leg. He was impressive, I think you’re right, he was certainly able to keep the Kiwis guessing about what was going on. You hear all the stories about us flying boat builders in from all around the world which was complete nonsense. I think it worked. Gary J: The pressure was on, you started to go fast and you were making good calls. What was in your mind day after day - it stretched on for a week? What was the attitude on the boat? Ben A: I guess in the end it was potentially a little bit of karma. As you pointed out earlier we went into the event minus two points for something that involved a different class of boat, something that was not the America’s Cup and something that was a complete balls-up. It was a complete lack of communication and a real honest mistake. We obviously got punished very hard for that and it was right that the team was made an example but at the same time it was a very harsh penalty. Maybe that was things just getting evened out a bit. But I certainly felt for the Kiwis. I sailed for the team for the 2007 Cup and know the guys really well - Dean, Ray and the rest of the guys. They’re all brilliant guys, great sailors and it was tough for them to have to go through that. 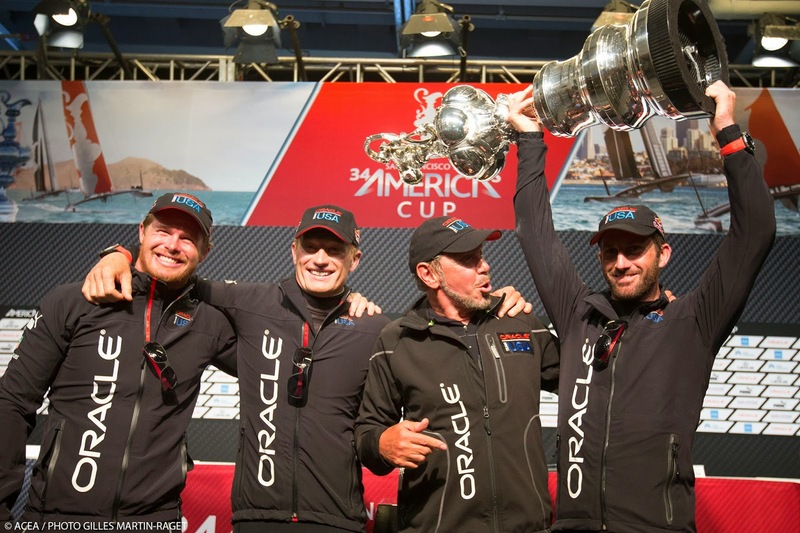 I think the hardest part for those guys was that they had a whole nation waiting in the wings to bring the America’s Cup home. The more out team got better and faster it must have been tough to deal with. Gary J: When the Kiwis almost capsized, what were you thinking at the time? Ben A: That was a real game changer. For most of us on the boat that was the first race where we actually started being competitive upwind and we actually caught them up on that upwind leg. For whatever reason they had a bad tack, whether they were rushed or had a mechanical issue, that’s really what put them in that difficult position. But certainly for us, that situation there gave us the belief that we could match them upwind and if we sailed well we could beat them and for our whole team that was a massive boost. Gary J: The Olympic Games in Weymouth, I was there and you were in the news like crazy - you were one of the superstars of Great Britain. How did you react to that pressure during the Games? Ben A: I guess I didn’t deal with it very well in the beginning because for the first six races I was beaten by the Danish sailor who sailed incredibly well and I was really - think I need to go to a sports psychologist and work that out. It was a tough situation, there was a huge expectation on all of the home athletes to perform. I think the hardest thing is with past Olympics when you go away to compete, you’re away from home and all the distractions - you get on with it. When you’re at home, all of a sudden you have to deal with the expectations of sponsors, family, friends - there were people I’d never met before who claimed they were related to me in some way - that’s hard! 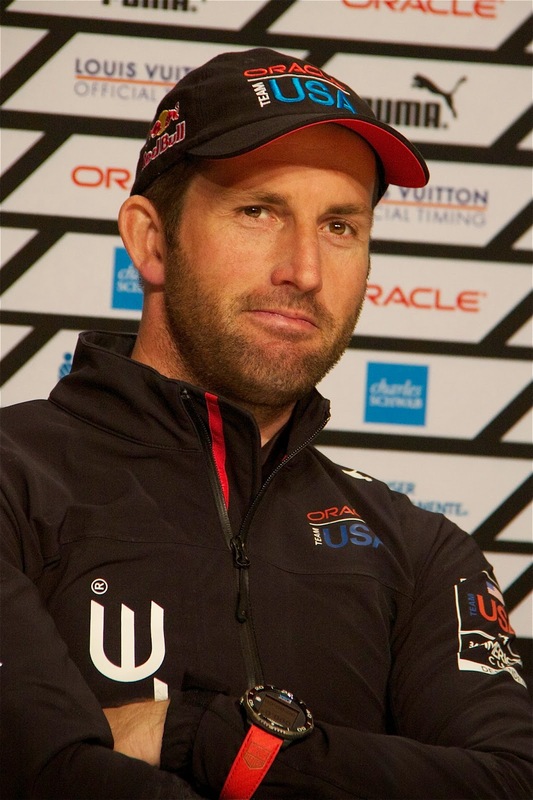 Gary J: There’s a question that’s been gnawing at me for about a month now...who are you going to sail for in the next America’s Cup? Ben A: That’s an easy question - I thought you were going to ask me something difficult. There’s a lot going on as you know - it’s an interesting period. We need to find out what happens with the next event what Russell Coutts and Larry Ellison decide they want to do. I think we’ll be happy being back here in San Francisco. It’s an awesome venue with great hosts. It’s no secret we’d like to have a British team involved in the Cup. Having said that, as we all know, it’s a big boys game. You can’t go into it without the right level of funds - you have to have the team with the wherewithal to win otherwise there’s no point. You’re wasting everyone’s time. We’re going to decide in the next couple of weeks if we can get that together so things are moving along quite quickly and hopefully that can be the case. Gary J: Is it scary coming into the leeward mark at 45 knots? Gary J: I understand very early on that both John Kostecki and Jimmy fell overboard. Did you ever fall overboard? Ben A: I very nearly fell overboard in training when I was steering the boat. The forces on the boat are amazing. We had designers who went out on the boat and they hadn’t been on the boat much before. If they were in the wrong spot and not holding onto anything when we were turning upwind, they’d literally go flying off the boat. So we did lose quite a few people off the boat. It’s easily done and we had some scary moments and I can say they were scary as we obviously know what happened to the Artemis team and to Andrew Simpson who was one of my best mates in the world. The America’s Cup was great but I think the way that the America’s Cup and the sailing community dealt with that was fantastic. Gary J: Tell us a little bit about Larry Ellison from your perspective? 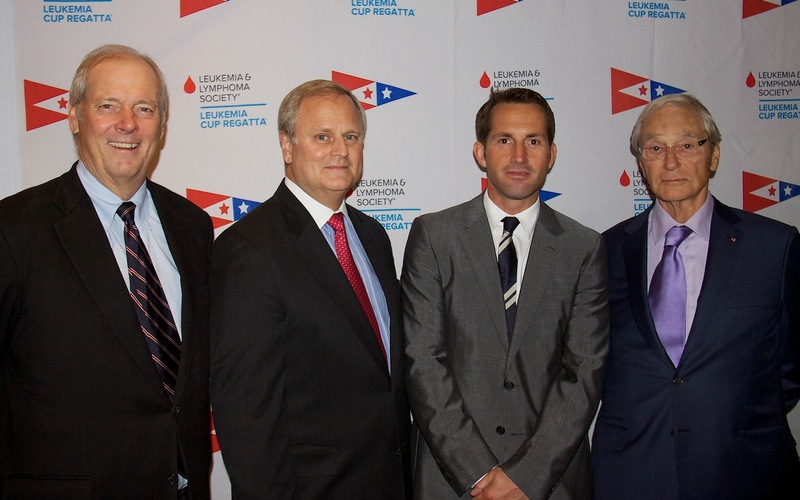 Ben A: The times I’ve known Larry Ellison he’s been very charming, very approachable, very knowledgeable about sailing. I think he’s clearly a very busy man. We saw him as a team perhaps three or four times during the whole 12 months I was with the team. I know he kept in regular contact with Russell Coutts and was clearly up on what was going on with the team, certainly he was out there everyday supporting the team - on the phone a lot to Russell during the races - he’s on it, he knows what’s going on. Certainly towards the end of the event he gave up his whole business week at Oracle World which must be one of Larry’s biggest weeks of the year work-wise, he gave it all up to support us which was fantastic. Certainly this whole thing that we’ve seen with the America’s Cup - yes, there’s been a lot of criticism, yes, none of us knew where this would really end up but we were fortunate that the event ended up the success that it was but we shouldn’t forget that it was really Larry Ellison and Russell Coutt’s vision to make it happen. The TV production in particular was stunning. Gary J: I think you should sail for Great Britain and come challenge here. You could be the enemies but it could be exciting and the British have had such a long unsuccessful history in the America’s Cup that you could be the guy to turn it around!